I was leafing through photos on my computer the other day, and landed on a photo that reminded me of an error I would probably rather forget. At first I couldn't work out what it was, and why I had it on my computer. Then I realised...it was an existing piece of our stock, but hardly recognisable. The photo here is the original photo of the piece when we found it in France. When my father Nick told me he was buying it I thought perhaps he had gone temorarily insane and promptly told him so. 'Perhaps jet-lag has a more sever effect on the brain than I had realised,' I thought to myself. He smiled smugly and said simply, 'just you wait'. That should have been a wake-up but oh no, I scoffed, laughed and disappeared in the pursuit of 'prettier' things. Big mistake! What I had failed to realise was that sitting under two hundred years of filth and grime was a gem. 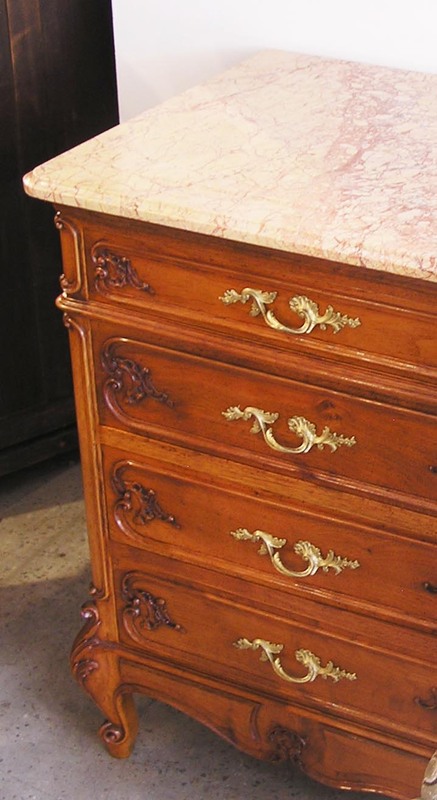 A beautiful 19th century French commode with its original gilded handles. Here's what I missed. This is a photo of the same piece retored to its original former glory. Click on the image to view in more detail.